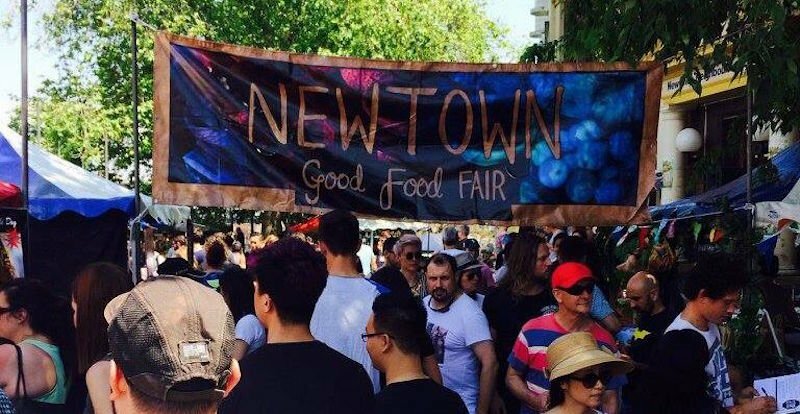 Celebrate Newtown’s infamous love of food with the return of the Newtown Good Food Fair this October. As the sun of spring seeps through the crowds, where else would you rather spend a Sunday than on the humming streets of Newtown. Surrounded by the diverse mix of aromas that have become synonymous with the trendy suburb, loose yourself in a crowd of 8,000 foodies on Sunday 14th October at the Newtown Good Food Fair. Newtown Square and Eliza Street will burst to life for the fifth year in a row, with a diverse range of 30 food and drink producers. The eclectic nature of Newtown will be on show for the family friendly event, with some of the areas favourite food and drink providers appearing as stallholders. Credited with reinventing the city’s burger scene, Mary’s will be on hand selling their burgers. Lovers of all things local, Acre eatery will be serving up heart-warming produced focussed creations alongside dessert aficionados Black Star Pasty and Gelato Messin . After arriving in the area at the end of last year, Merivale’s Queen Chow will also take their Cantonese and dim sum creations to the street. Wash it all down with drinks courtesy of Solotel and P&V Wine and Liquor Merchants. And there is nothing more Newtown than Young Henry’s so expect them to be there pouring their beers amidst the hip street party vibe. It may be a party, but feel free to bring the kids. There will be enough fun and frivolity for the young ones. The Kindifarm will keep the animals and kids contained while you enjoy a drop of local liquor. The Newtown Good Food Fair will also give the community the opportunity to give back to those less fortunate with a charity drive supporting the Newtown Neighbourhood Centre through various fundraising initiatives. From hole in the wall eateries to hidden bars, Newtown is a vibrant melting point. The Newtown Good Food Fair is the perfect time to discover the wonders of this urban delight.